The National Shrine of St. Maximilian Kolbe at Marytown is a place of pilgrimage for the faithful dedicated to promoting the witness and life of St. Maximilian, a Conventual Franciscan friar and priest, martyred in the Holocaust. It is filled with artistic beauty, cultural and historical significance, and deep spiritual renewal. The National Shrine includes the Our Lady of the Blessed Sacrament Chapel, an educational Holocaust exhibit, and the relics of Saint Maximilian, a full service Retreat & Conference Center and the biggest Christian Bookstore and Gift Shop between Chicago and Milwaukee! Adoration Chapel Live Stream Make a pilgrimage to Marytown and visit Our Lady of the Blessed Sacrament Chapel. 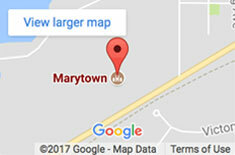 Marytown Gift Shop Visit our online store for a wide selection of publications and religious gifts. As Illinois faces so many pressing issues involving human life and dignity, it is incomprehensible that our elected officials have decided the pressing issue of the day is to enhance the chances that the lives of the most vulnerable and voiceless will be taken. Their efforts, similar to recent actions in New York and Virginia, focus on corrupting our God-given right to life and sowing unnecessary division. CLICK ON NEWS TITLE FOR FULL STORY. Enjoy highlights from the sacred music concert performed on April 28, 2018 to commemorate the 100th Anniversary of St. Maximilian Kolbe&apos;s Priestly Ordination.